Jennifer Hudson Gets An On-Set Visit From Son David! 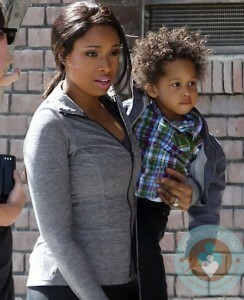 Home » Jennifer Hudson Gets An On-Set Visit From Son David! Jennifer Hudson got a surprise visit from her son David on the set of a Weight Watcher’s commercial in Los Angeles on Sunday(April 15). The actress was all smiles when she spotted her curly haired guy arriving with a friend in a blacked out SUV. During an interview with Good Housekeeping in January she revealed that she has lost 80lbs since joining Weight Watchers. Her size, she told the magazine, caused her to lose many opportunities including a backup gig with Barry Manilow and possibly a finalist spot on American Idol. Today Jennifer is a healthy size 6 and is on a maintenance plan. Rather than working out every day, which was previous regimen, she does it four times a week. And she says she has become so accustomed to healthy eating that she’s lost the taste for the heavy fare of her youth, such as burgers. She looks great and is spreading a good message. Moderation, healthy choices and staying active; three key elements to staying fit.